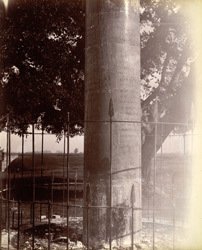 Photograph of the lower part of the Ashokan Edict Pillar at Lauriya Nandangarh, Champaran District, taken by Alexander E. Caddy in 1895. Ashoka (reign ca. 272-231 BC) is the most well known king of the Maurya dynasty. After his conquest of the kingdom of Kalinga in modern day Orissa, struck with remorse at the suffering he caused, Ashoka converted to Buddhism and spent the rest of his life propagating his dharma (law). In order to achieve this, he had numerous edicts inscribed on rocks, pillars and caves throughout his vast empire. These are written in various vernaculars and represent the earliest written document from the Indic regions. From these edicts it would appear clear that Ashoka was an extremely tolerant and benevolent monarch. It was originally thought that Ashoka was the first to erect pillars, however recent interpretations have shown that it is more likely that the edicts were inscribed on pillars that had been sculpted in the preceding centuries, and already had religious connotations. The pillars were imbued with cosmological tradition; each symbolised the world's axis, the separation between earth and heaven. The pillar at Lauriya Nandangarh is still intact and has six edicts inscribed on his polished sandstone shaft. It is situated on the trade route that used to connect the eastern Gangetic basin with western Asia. The lotus bell capital supports a drum carved with a row of geese. A seated lion crowns the capital. The pillar reveals an influence of the Achaemenid tradition.